Rosemary Knits: Long time, no post! I've been a busy bee, and I'm going to get busier soon. I attended another Pajama Jam at The Lamb Shoppe - great fun, as usual. 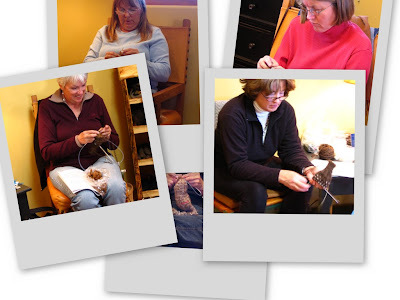 I taught another thrummed mitten class to a bunch of the most eager mitten knitters I've ever seen. Most of the class didn't need a teacher - most of them could have taught the class themselves but we all had a great time, just the same. Check out the knitting school at Eyedazzleralpacas.com for more information. Allie has great things planned for the spring semester - keep checking! You can also contact her and ask to be put on her email update list. We took a week-long driving trip, and we had a blast. We like to do this every October because October in the west is perfectly beautiful. This time, we went to Arches National Park and Moab, UT, where I found this delightful store, http://www.desertthread.com/ - it's a great store with a little bit of everything. A few days later, while journeying to Rocky Mountain National Park, we stopped for coffee in this darling coffee shop in Hayden, Co. and what did we find? KNITTERS!!! I wish that I could remember the names of these lovely ladies, but I don't. The nice lady in the red shirt, second from the left, represents http://www.knitfit.org/ - something that I never heard of, but which looks like fun, yes? They were the friendliest bunch ever and they meet every Friday morning at 9am or so. Join them! Before that, my mother in law visited us for a week, and we had a blast. I reawakened her interest in crochet and sent her home with a project! She is a great gardener, and while she was here, she helped me with lots of yard work, and look what we discovered in the back yard - a fellow spinner! Isn't she beautiful? Moving further into the past, lol, I knitted a neck warmer (wimple, smoke ring) out of the skein of alpaca which I dyed with indigo at the Natural Dyeing Class up at Eyedazzler Alpacas. It came out great, but I blocked it to death, and need to try and re-block it. Soon, I'm going to blog about how I was able to invisibly kitchener the end to the beginning, yarn overs and knit two togethers and everything. I'm soooo proud of myself! I nearly had a complete brain-freeze, but I stuck with it and it came out great. As I was knitting this neckwarmer, of course I had to make myself some new knitting needles! I'll tell you all about it in a future blog, too. It was easy but time consuming, and probably not worth the effort, but the little needles *did* come out cute! Now, I've moved back in time to the late summer. I was looking forward to lots of knitting on our trip to Moab, so I needed some MORE NEEDLES, lol, and I experimented with using store bought Bryspuns and Boye interchangeables to make circulars. Success! It was easy as pie, and I'll tell you all about it in a later post. Finally, I spent all summer in spinning heaven - I've already told you about my Aguilar wool, but I haven't told you about all of the spindles I've made all summer. I'm completely in love with these jewel doughnut spindles. I plan on writing detailed posts about making circulars out of Bryspuns, making spindles out of jewel doughnuts and truck wheels, making straight needles out of skewers, and a detailed post about knitting and kitchenering the neck warmer. If any of these topics interest you, then check back soon! I came across your blog from my iGoogle page, it highlights recently posted knitting blogs for me. The jewel doughnut spindles are beautiful! I love learning new things -- your planned writeups sound *terrific* I look forward to all of them. And now I can keep my straight needles without guilt -- for your circular conversion project, LOL. where can you find those jeweled donut gems? we had that same spider in our yard last summer!!! !